Festival music of EDM (Electronic Music Festival), the largest known as the Dreamfields Festival 2015, will be held again this year in Bali. This festival will be held in the same place, the same month, on the same island, Bali. 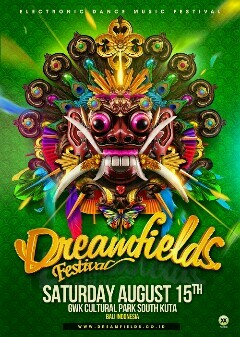 Dreamfields Festival is a music festival that presents music from the disco with DJ of renowned worldwide. Last year the festival has been successfully held in Bali, until all tickets are sold out. Dreamfields Festival 2015 will be held on August 25. Locations of festival at the Garuda Wisnu Kencana Cultural Park. Is likely to be the same as last year, was held for a full day, evening, night, until morning. The distinctive feature of this music festival is a big stage with a full color, and sound very loud disco music. Dance music that will make visitors leaping while holding a drink. Last year, Dreamfields Festival 2014, has come under fire from residents who live around the pedestal, and residents who live in the all the way to the pedestal. They feel interrupted by traffic jams, a result of the number of visitors very much. Residents around the GWK provides a protest to the manager, because their activities disrupted. This year the possibility of the same events will happen again, otherwise serious coordination between managers and local residents. Dreamfields Festival will lead to traffic congestion along the path to the pedestal. Because the festival is highly favored by fans of dance music.